To say the Divergent trilogy by Veronica Roth is gripping would be an understatement. It is in the same genre as the Hunger Games, and as with that trilogy, it carries you off like a tornado, never letting your feet touch the ground until it leaves you nerve-wracked and washed out somewhere beyond the last page. I’m still recovering! In that helter-skelter, place is of less importance, except in the last book of the trilogy. Description of the context is scanty if non-existent. Only the occasional object necessary for the action is mentioned: a mirror, a table in the kitchen, a pole in the bus, or snatches of the city as Tris, the main character, rides through. Too much description would slow the forward movement of the story, but also a solid decor would be at odds with the precariousness of the world they live in. 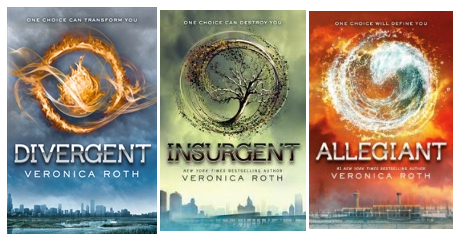 Although the reader may not realize it till the end, Tris’s world is by nature temporary. The story is a single, female, first-person narrative, except in the last book of the trilogy, where there are two first-person narratives because the end of the story cannot be told from one individual perspective. Fragments of memories mixed with Tris’s thoughts and bits and pieces of the present accompany the constant action. If there are flashbacks they are also tiny. Each of these snatches or scenes revealing Trice and the world around her. The heart of the story is about fitting people into a rigid set of categories. Once these categories established in the social order, the author works with feelings of belonging, the fear of exclusion, the pain and joy of difference and ultimately the arbitrariness and inhumanity of such a categorization. A number of key points in the plot wouldn’t hold up if you examined them closely. But to a large extent that doesn’t matter because you are carried forward by the momentum of the story. It is that forceful transportation of the reader and the feeling of emptiness and desolation when the story finally releases its grip on you that have me wondering about this trilogy. Despite the fact that it deals with essential issues, in a heartfelt or should I say gut-felt way, I object to being dragged through the ruins of society, forcibly being made witness to all manner of violence and despair. Is a poignant love affair and the blundering quest for what’s right enough to offset the sinister shadow this story leaves over us?